Celebrating your wedding anniversary is a must-do. For each year, there are traditional ways to show your love and offer a gift. For example, the first wedding anniversary often symbolizes a year of adjustment, where you reflect on the delicate and hardy aspects of your first year together. Giving a gift involving paper can represent the strength of your first year, due to its interlaced threads, while offering a clock can symbolize eternal love. The second wedding anniversary traditionally symbolizes cotton for the interwoven fibers, but a modern take can include fine china. The third wedding anniversary is often when a couple is aware of the durability of their relationship. For this reason, leather is the traditional gift to offer. As a material, leather is durable, warm, strong, flexible, and has a sense of resiliency to it. Symbolically, these are the qualities that help marriages continue to thrive. Consider custom leather keychains, trays with your vows on them, journals, and other items that are unique to your relationship. If you want a more contemporary or modern gift, you can opt for something made out of crystal. Crystal can dazzle with its beauty and the way its light dances off surfaces. It is a gentle reminder of how a couple in a meaningful marriage can touch the lives of others. Consider picking up a wine goblet, crystal figurine, or beautiful vase for your third wedding anniversary gift. The appropriate gemstone for a third anniversary is a pearl or jade one. Similarly, a white or jade green color traditionally represents this anniversary year. You can also incorporate the flower, fuchsia, which symbolizes taste. 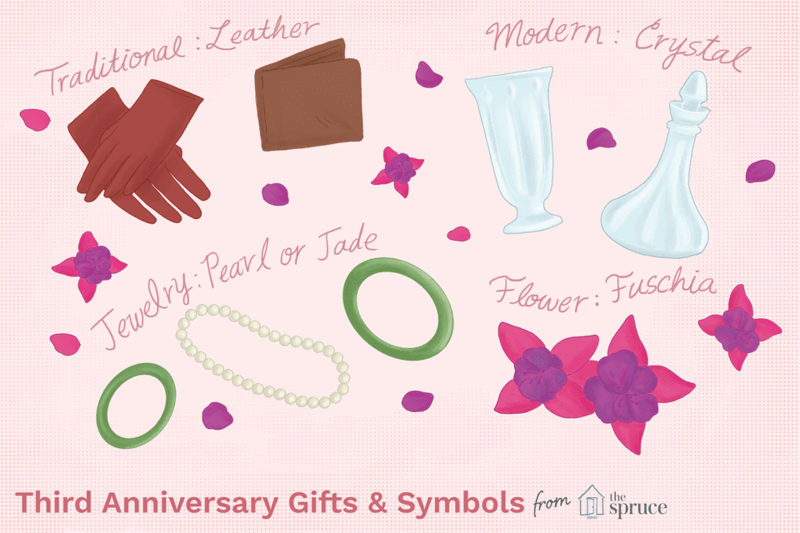 Combining these symbols along with your gift idea or overall celebration is a way to tie traditional wedding themes to your reminiscent day. One easy addition to any gift is a small piece of jewelry made of pearl or jade. You can also make an array of items with a gift basket. Imagine a variety of items together like fuchsia plants, a pair of leather garden gloves, and a coupon on jade green paper stating your willingness to help get small plants in the soil. Since leather is the traditional gift for this anniversary, you can consider planning a western-themed evening together. With this theme, you can put on a western, listen to country love songs, and cook up a nice traditional meal together. Incorporating normal date night ideas can add a great touch. For instance, you can plan a movie night and watch your wedding video afterward, or you can go out and get tickets to a movie, sports event, concert, or play. If you don't want to do something everyone else does, mix it up and go out to breakfast instead of dinner, go to a local wine tasting during the day, or get intimate by taking a shower together.